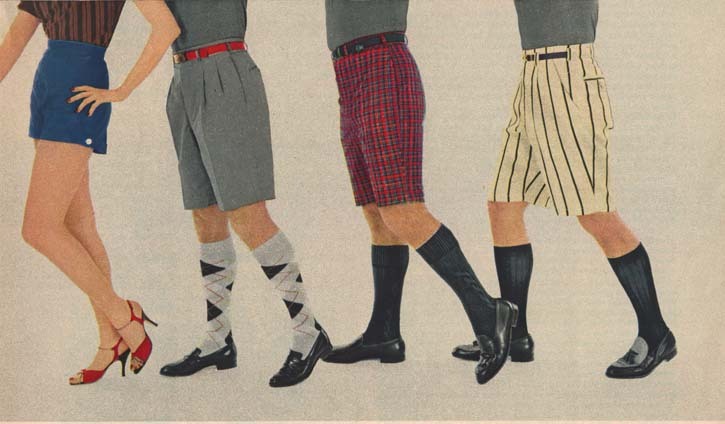 Esquire menswear magazine’s fashion spread on top shorts for the summer of 1956. The shorts story is longer than ever before, in terms of style and fabrics. Ever since Esquire made the first break ( in the March, 1953, issue ) the fashion has taken off and now is winning in a breeze. Time was you could find one store in town had a pair in grey flannel. Now look them over: in cotton, pleatless front; India madras; short cords for action, wash and wear; blend fabric in stripes. Unusual toggle pocket, no pleats; rich tone India madras; natural poplin; bright India madras. 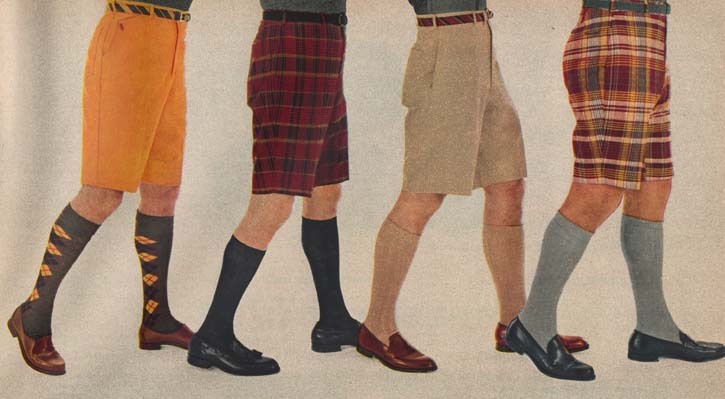 Oops, never mind the shorts; cotton pin-checks; cotton tartan; bold vertical-striped blended fibers. Striped India cotton; Glen Urquhart plaid in cotton; light-weave linen. Don’t forget to wear them knee length so that you don’t look like a fugative from a basketball team. 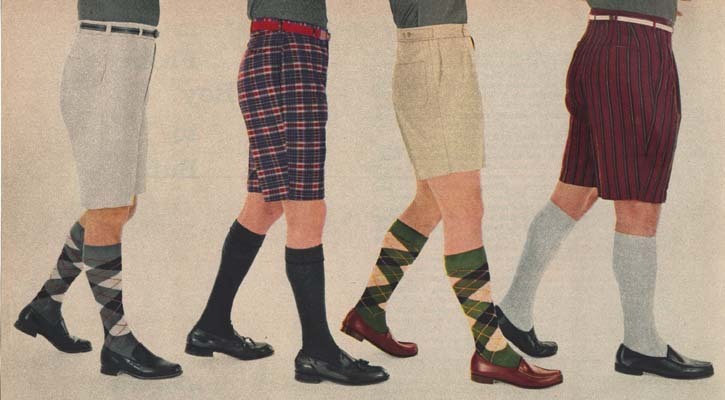 With them you’ll want knee-length socks in contrasting designs. The shoes of course should be the moccasins or sports styles shown above. And wear these shorts with a swagger, lads. This is a fashion with comfort men have been awaiting for so long, and now -in its many forms- it has entree anywhere. The colour coordination is excellent. Hope this style comes back in (did briefly in the late 80s). I have the loafer model in the first picture, the second man from the right, the low vamp brown loafer, without tassel that show most of the instep. 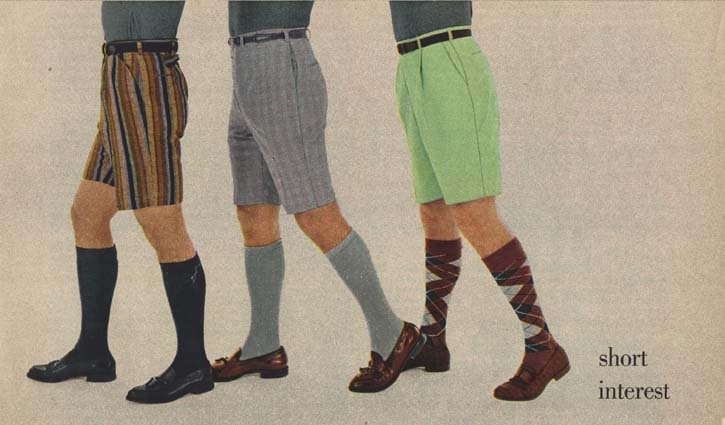 But I prefer it with no socks if I’m wearing shorts with the shirt untucked, as it looks more modern and younger (I’m 23) and my feet also feel less warm. I also wear them in late winter and spring but with socks and jeans. Not in cold winter: i wear then knee boots under jeans sometimes.